If you're looking for some in-your-face boldness, you're going to get it with Bull's Eye. Out of the jar, this sauce will add hefty flavor to anything you slather it on, which, for better or worse, might overpower the delivery device. When cooked, a lot of that heavy flavor mellows and the sauce creates a beauty of a piece of chicken, but taste doesn't quite live up to looks. For a national supermarket brand, it's a pretty solid choice, with some nice attributes both out of jar and after cooked. 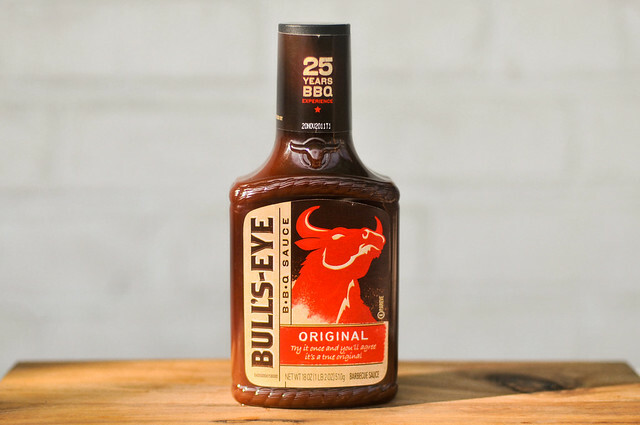 I can't imagine there are many people out there that don't think of Bull's Eye when they think of barbecue sauce. As far as I can tell, this is all due to intense marketing efforts of Kraft, who produce this sauce. 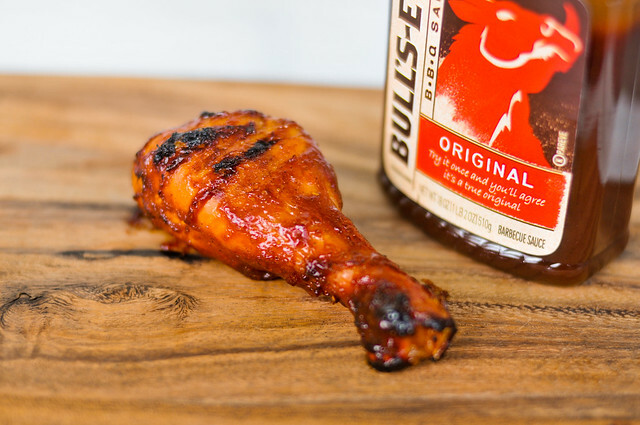 Labeled as "the bold choice" for barbecue, Bull's Eye can be found it just about every supermarket I know of, and comes in nine different varieties. A smokiness fills the nose, with a sweetness that cuts through when it starts to verge on too much. That sweet runs deep, clearly being the product of some heavy molasses. 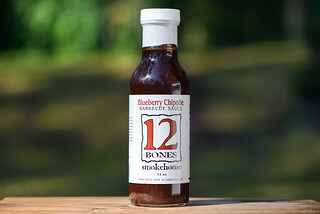 The smoke mixes with the vinegar fairly seamlessly, with neither dominating or overpowering, leaving the sauce having a robust, nicely balance aroma. This sauce runs thick, with a heavy cling to a suspended spoon, only coming off in globs intermittently. 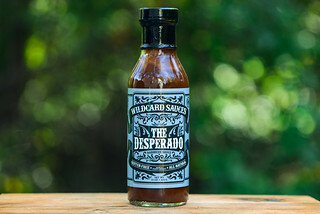 The opaque, brownish-red sauce hides most of the spices, unless held up to the light where you can get a hint of the seasonings giving this sauce it's heavy-handed flavor. Those Kraft marketers got this right, it certainly delivers on big, bold flavor. The smoke really packs a wallop, with the vinegar only intensifying the tart smokiness. Between the initial hit of smoke and the final tang left on the tongue, there's a nice tomato/molasses sweetness with hints of onion and garlic thrown in. The sauce has a syrupy feel, the type that coats the tongue with a somewhat over-processed feel. Bull's Eye sure produced one fine looking piece of chicken. Baking in beautifully, and only caramelizing the perfect amount at the end, this sauce was certainly made with grilling in mind. Unfortunately, the good looks came at a cost in flavor. Those bold flavors that made this sauce stand out before became muted a slightly dull. The smoke and sweetness that were strong in the sauce before were still there, but to a lesser degree, making this chicken leg one that wouldn't stand out much in a truly blind taste test (they have the eating with your eyes part down superbly). If you're looking for some in-your-face boldness, you're going to get it with Bull's Eye. Out of the jar, this sauce will add hefty flavor to anything you slather it on, which, for better or worse, might overpower the delivery device. When cooked, a lot of that heavy flavor mellows and the sauce creates a beauty of a piece of chicken, but taste doesn't quite live up to looks. For a national supermarket brand, it's a pretty solid choice and I'm actually looking forward to trying out the rest of the Bull Eye's family to see what they have in store. I love the Bulls Eyes BBQ sauce. Its great for grilled stuff. What is the origin of modified food starch in your sauce? 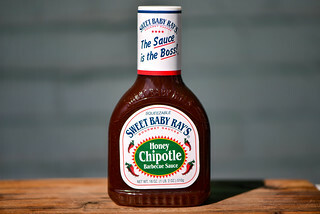 Red Bull Barbecue Sauce has been the mainstay for many people who avoid corn syrup, which isn't good for anyone. However, today, in the grocery store, I noticed on the label that the ingredients have changed so that corn syrup is the first ingredient. I found another sauce, but it won't be like the original Red Bull sauce. What gives? I like the Bulls eye, but i like the jack daniels bbq sauce more! Neither good nor bad. Middle of the road commercial sauce. In a pinch I would buy it. 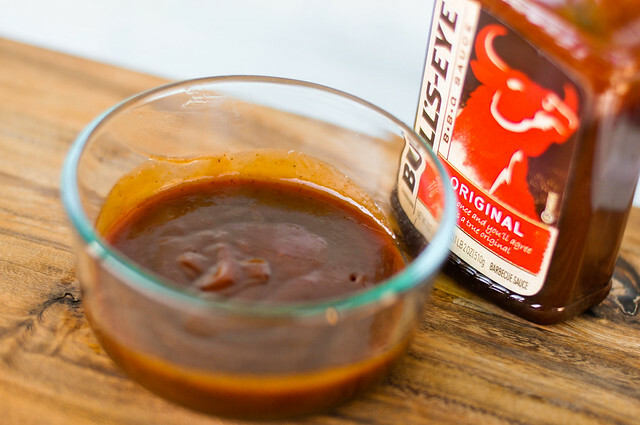 Bulls Eye Original BBQ Sauce no longer has the original ingedients and has replaced cane sugar with high fructose corn suryup! The idiots at Kraft have decided to expand their profit margin at the expense of your health. Do not buy their poison! Those of us who read lables and have become educated about the detrimental effects of high fructose corn suryup will no longer purchase or consume this product and will tell family and friends to stop as well. Who ever thought of changing the original ingredients of the " Original " Bulls Eye BBQ Sauce to include high fructose corn suryup should be fired! The portrayal of HFCS being an unhealthy alternative in foods compared to sucrose does not have any substantial evidence to prove it is true. Chemically, they are made up of the same two monosaccharides, glucose and fructose. Uninformed alarmist stuff like this is what's driving trends like failing to get infants immunized against childhood diseases. I remember the first time I ever tasted this sauce as a kid. It was totally different than what my idea of "barbecue sauce" was. It had the right mix of sweet, smoke, and spice that I noticed even as a child. It remains my favorite, even though I know more sophisticated sauces exist.